My first sighting of Nudibranch in Abu Dhabi waters (to my knowledge the first recording in the UAE) was made on January 21, 1980, while diving with sub-aqua equipment. Nudibranches are mollusks with little or no external shell. They are sometimes known as sea slugs, resembling their terra firma counterparts in shape. Nudibranches are carnivorous. Many different species exist throughout the world, some of them being very attractive to look at. So far only one location has been established. This is near the channel, east of Abu Dhabi, close to the Tourist Club. The site is a 30-foot deep lagoon surrounded by sand banks. The seabed here is composed of a mud/silt mixture. Two Nudibranches were observed grazing on the bed of the lagoon. The observation was made while completing an organized diving activity under the auspices of the Tourist Club section of the British Sub Aqua Club (BSAC). General shape was as shown in the sketch. The body was black with lighter contrasting pimples and antennae. 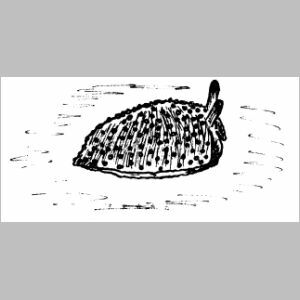 A thin gray skirt surrounded the base of the sea slug. The two specimens seen were respectively 2.5 cm and 1.5 cm in length. This is rather difficult as little is known about Nudibranches of the Gulf region. Since this is the first positive sighting, I believe they may be rare. However, the specimens observed could be Onchidella celtica. O. celtica are fairly common along the southwest coast of the UK and can sometimes be seen on uncovered rocks at low tide. If anybody possesses references on Nudibranches of the Gulf area, these would be most welcome.